One of the things I’ve missed since moving north from our country home in Texas 13 years ago has been having chickens, and our own fresh eggs. Having a new grandbaby made my chicken longing all the more compelling–I might be able to accept eating store-bought eggs for myself, but my granddaughter must have only the best and most nutritious! Being a busy grad student and nurse meant I thought I didn’t have time for DIY projects, so my original intent was to purchase a pre-made coop and chicken run. To my amazement, I found a chicken tractor on Amazon.com–with FREE super saver shipping! I happily placed my order. 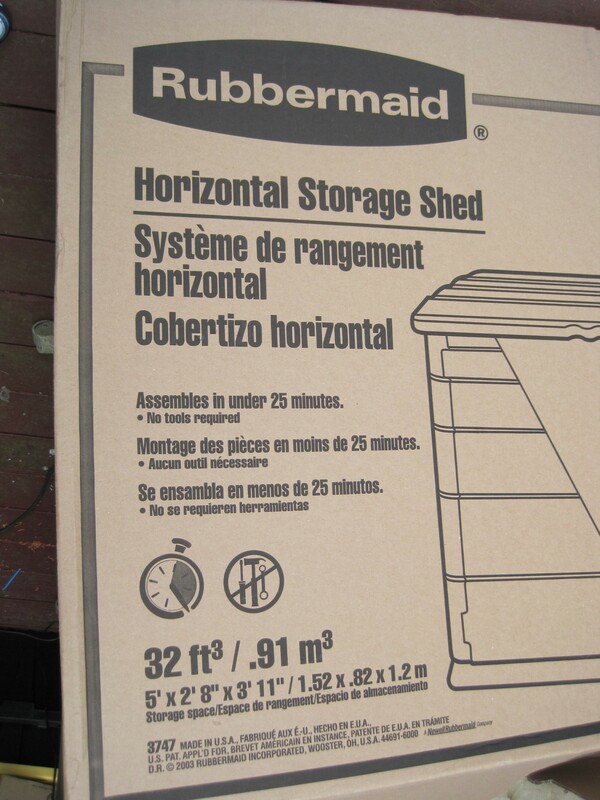 I bought a Rubbermaid storage shed at Home Depot. 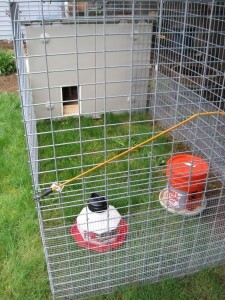 Inside, I added a roost and a rack to hold the “nestbuckets” made from Home Depot buckets. 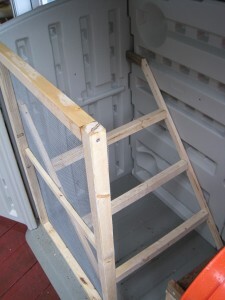 I also made a screened wall on one side, so that one door can be left open for ventilation during nice weather. To secure the wooden fixtures, I drilled holes through the walls of the coop and screwed wood screws through from the outside into the wood pieces. Where possible, I took advantage of the shapes and depressions of the plastic to add additional support. 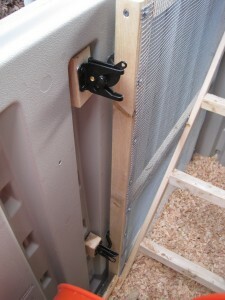 The screen wall is fastened to the wall of the coop and also to the roosts. The nestbuckets are not permanently fastened to the rack they sit on — I use a bungee cord to hold them securely in place. 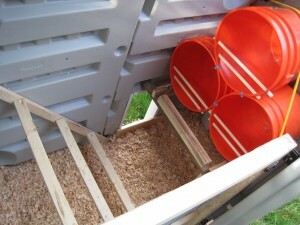 In the back of the coop, beneath the nestbuckets, I cut an opening for the chickens to use for going in and out. I made a mistake and made it flush with the floor, before realizing that there should be a “lip” to hold the bedding in, so I added a scrap piece of lumber across the bottom for that purpose. I used strips of trim to “frame” the opening and hide the hollow walls of the Rubbermaid container. Since there’s no way to keep the right-hand door closed when the left-hand one is open, I added gate latches on the inside to fasten it to the screen door. I can easily reach the lower one by reaching down through the top of the coop, but for people whose arms aren’t as long as mine, a pull string could be rigged for that purpose. The last step was to add four eye bolts to the outside of the coop, to secure it to the run (I’m using bungee cords for this purpose), and to add strips of 2×2″ lumber to use as handles, since the smooth plastic makes it hard to get a grip on it for transporting the coop. The run is made from two cattle panels with 2×4″ openings, using pig rings to secure the pieces together. The sides and top are each a half panel. The remaining piece was cut into 3 parts. Two of them form the end of the run farthest from the coop. 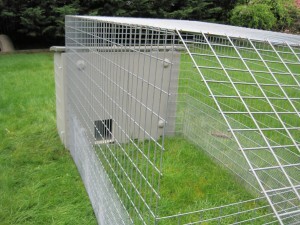 The bottom half is fastened permanently in place, and the top half is fastened only at the top, forming a hinge that allows it to be swung up onto the top of the run for access to the inside. 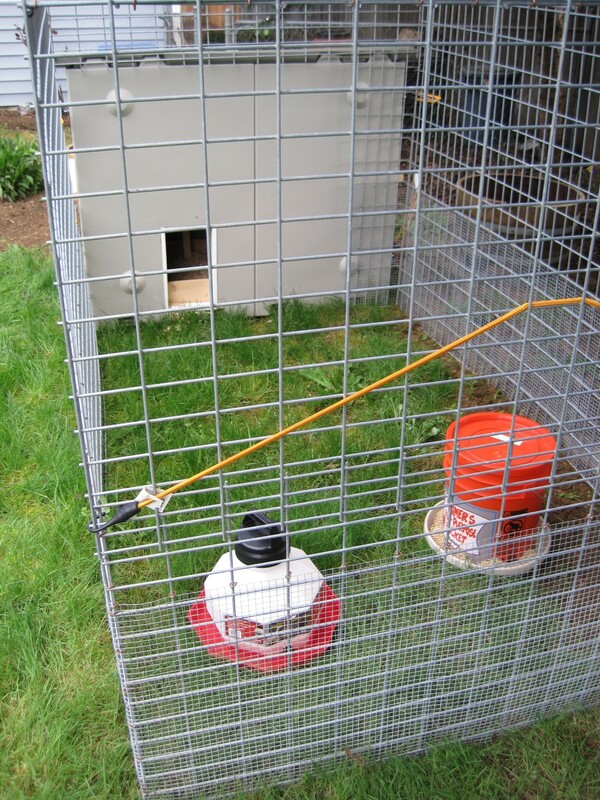 Again, I used a bungee cord to fasten the access panel in place when it is closed. I’m tall enough to easily step over the lower piece, but someone without my height advantage might need to modify the design to work for them. 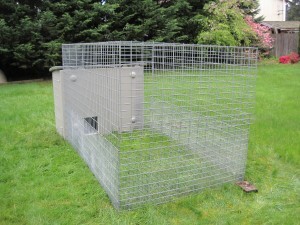 The remaining thin piece of cattle panel was fastened vertically to one side of the end of the run next to the coop. 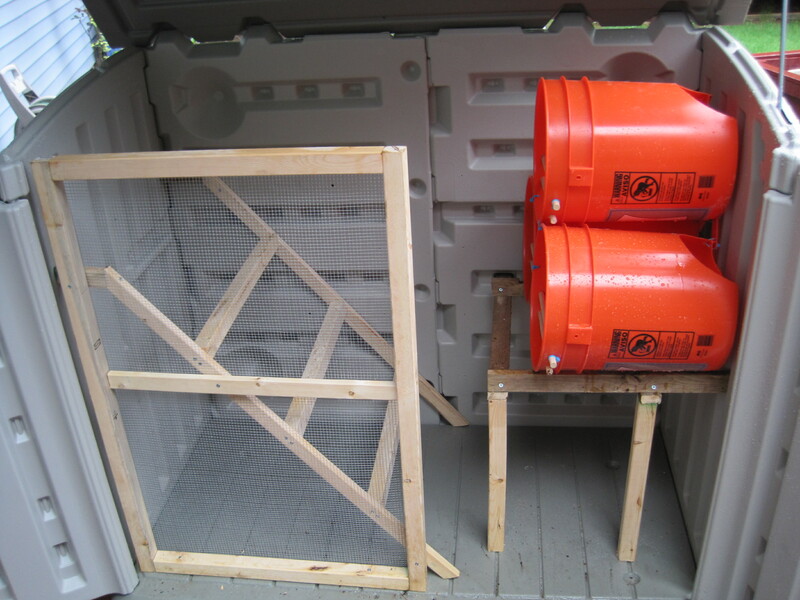 It adds some structural stability as well as allowing for the fact that the coop is not quite as wide as the run. 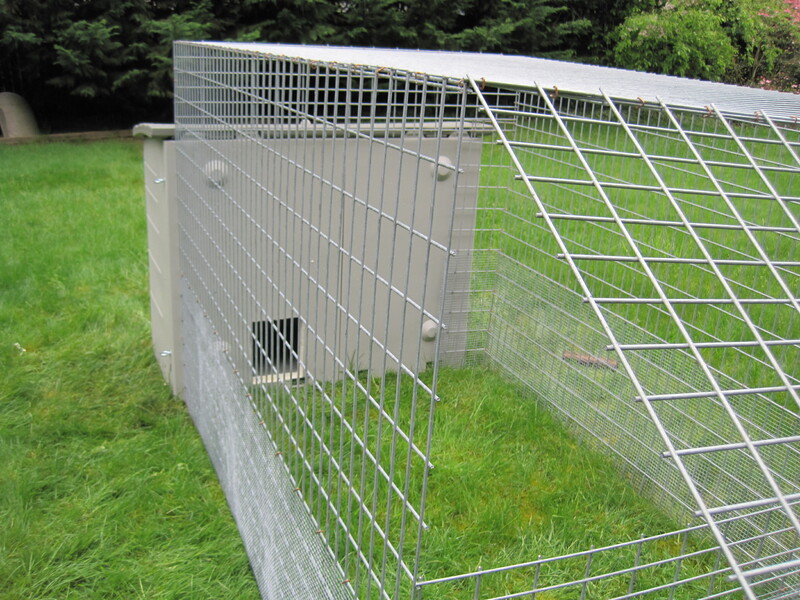 A 2-foot wide strip of hardware cloth with 1/2″ openings was fastened all the way around the lower portion of the run, to keep raccoons from reaching through to grab the chickens. 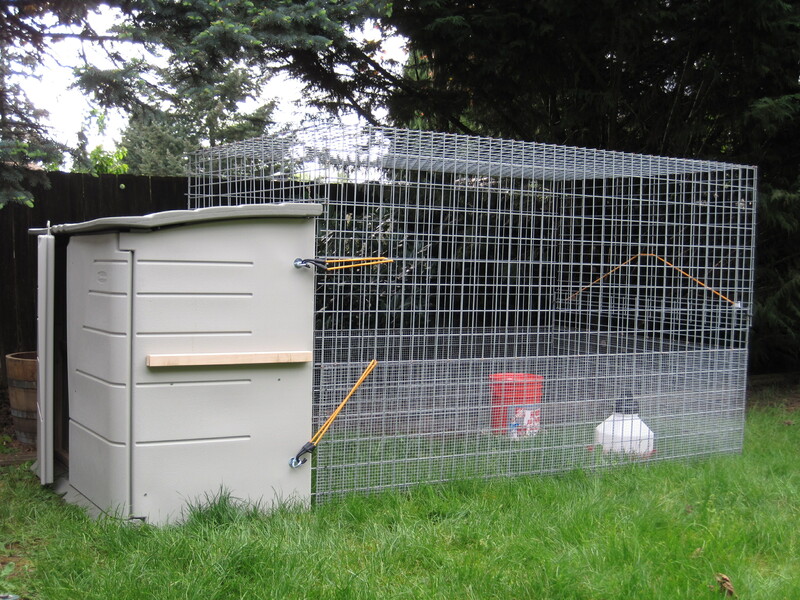 Love your chicken coop…. very city yet high function. Nicely done. How has the coop been working out for you? Have you made any further modification? Is the ventilation sufficient? Does it have access to electricity of lighting? The coop has worked out really well. We open up the front during the daytime, so ventilation isn’t a problem — winter will be the true test in that regard. The run is pretty heavy, so it takes 2 people to move it, but that’s not too much of a problem. 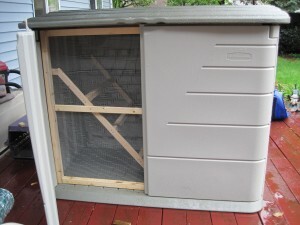 How many chickens does this coop hold or could hold? Either you’ve used a very old profile picture, or you’re a very young grandmother! Good luck with your chickens. 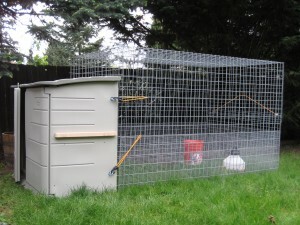 I love your chicken coop idea. I am working on trying to do the same thing this weekend. Do you use 2×2 for the screen door? 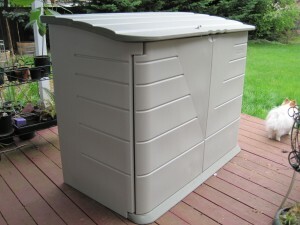 Is the screen dopor attached only to the side of the rubbermaid or do you attach it to the bottom, as well? How has this coop worked for you during the winter? I live in Illinois and it can get very cold here. The screen door is made from 2x2s. 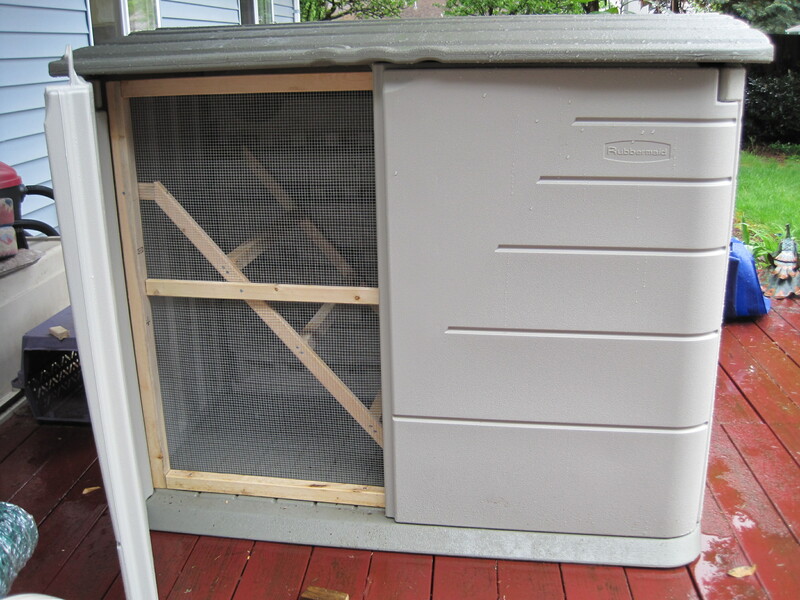 I attached it at both the side and bottom, but now I’m wishing I had figured out a way to either hinge it or make it removable, as that would make the coop easier to clean! 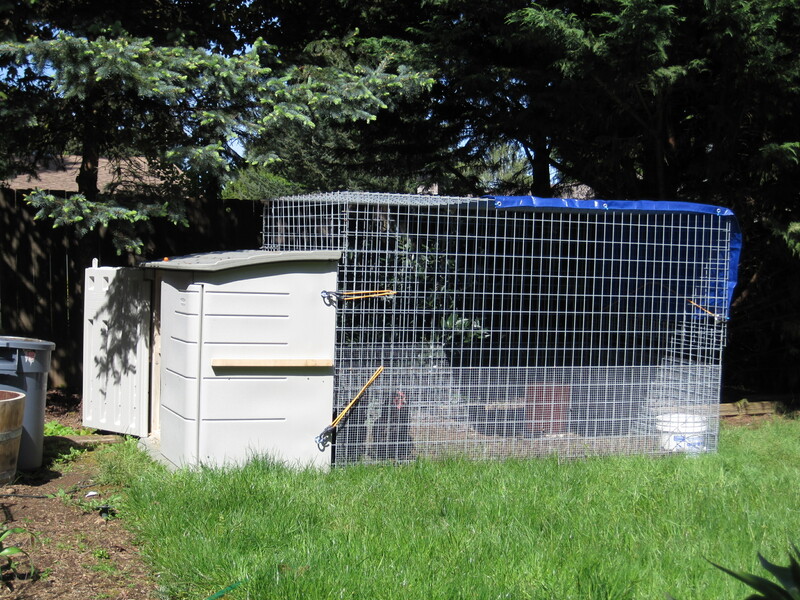 The coop worked well for us during the winter, but our PNW winters aren’t as harsh as yours. I’m planning to caulk the seams before next winter, because with all our rain, a lot of moisture made it in. That would also help to make it warmer, although I’m not sure how you could seal around the top opening (maybe a rubber gasket, of sorts? ), so you’d still lose some heat there. Oh, yes! 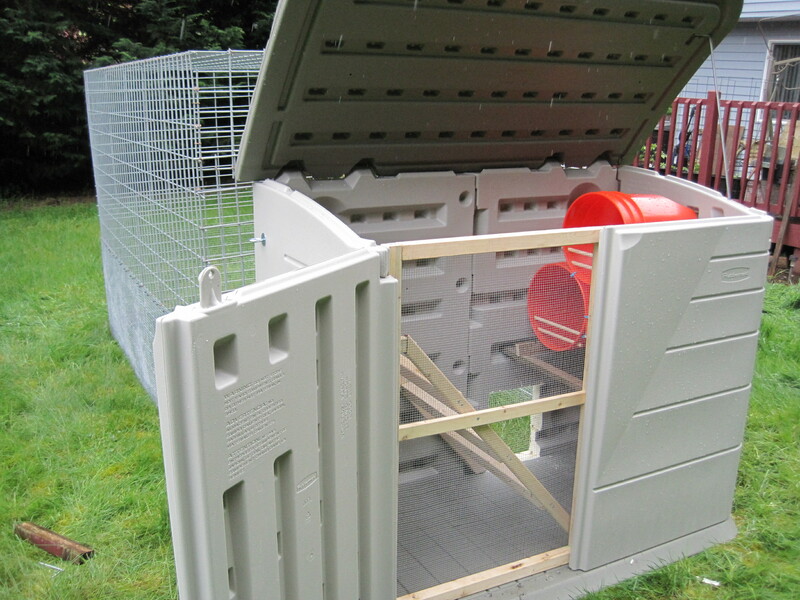 Your Coop & Run ideas spark my imagination. So glad to see it survived a year in such good condition. Upon seeing yours, I scraped my Rube Goldberg plans of creating one. Thanks, Geek2Nurse! Wow! Just wow! This is such an awesome idea! Excuse me if I am asking duplicate questions – this is just so exciting! Do you find that it is easy to clean out? Does it absorb and keep odor? How did you coop work out? any new modifications? Any does or donts? I have a smiler one that is about 2 feet taller. Thoughts? I’m wishing the screen part was hinged, or somehow easily removable for cleaning. Other than that, it’s working very well. 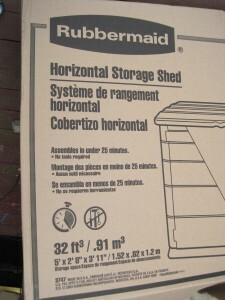 I am thinking of using a children’s playhouse also made by rubbermaid. How do you think that would work?